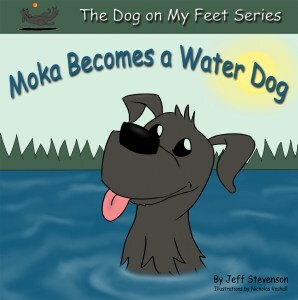 The Dog on my Feet series starts out with Moka Becomes a Water Dog by Jeff Stevenson, illustrated by Nicholas Voshall. Ethan and Lucas get a new Labrador for Christmas and she loves to play at the cabin on vacation. She has never been in a lake before and is a bit fearful of the water. Dad has a brilliant idea to tempt Moka into the water to play, helping her to forget her fears. Moka loves her new toy and learns to be a water dog! This books makes an excellent easy reader. The words are basic and easy for a beginner to read. The simple, large text will help kids feel confident in their skills while learning about Moka and her adventure to becoming a water dog. Illustrator Nicholas Voshall adds comedy to the book with his childlike drawings, giving the story an overall feel that it was created by a youngster, for his friends. The back of the book includes activities for the young reader to enjoy. A few coloring pages, a maze and a word find. Watch for the 2nd book in the story coming soon Moka's Pillow Party! !